According to an article published by The Setonian on April 15, a course on homosexual “marriage” will be offered next semester at Seton Hall University, a Catholic university in New Jersey with approximately 10,000 students. 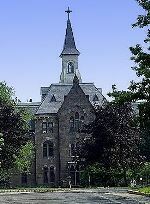 Seton Hall is the oldest diocesan university in the nation founded in 1856. Here is the red flag: The course will be taught by Professor King Mott, a pro-homosexual activist whose biography, posted on Seton Hall’s web site, mentions his affiliation with Lambda Legal, Center for Lesbian and Gay Studies, and Human Rights Campaign -- groups that promote ideas that run contrary to Catholic moral teaching. Although the article in The Setonian affirms that the planned classes will not be used as an advocacy tool, many find the assertion hard to believe. In fact, in a paper titled "The Sanctity of Marriage: Current Boundaries and the New Vocabulary," Prof. King Mott writes: "Efforts to condemn the [homosexual] culture itself as Pope John Paul II has done in recent encyclicals only illustrate the futility of orthodoxy in general and the papacy in particular." "The notion that marriage is a stable and ancient human arrangement, derived from divine revelation, limited to that existing between one man and one woman, and binding save through the permission of a single Church is contrived. It is laughable to consider that human relationships could ever find satisfaction and expression in this single interpretation of marriage," he continued. "To be 'gay' is not to identify with the psychological traits and the visible masks of the homosexual, but to try to develop a way of life. This is exactly what must happen in the debate over marriage rights." 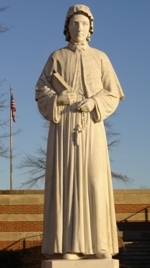 Seton Hall University is named after Saint Elizabeth Ann Seton, the first American born saint. Why should any Catholic university sponsor a course that leads students away from the truth? Why should the Catholic classroom be used as a tool to advance the homosexual movement and undermine traditional marriage? In our hyper-sexualized culture, Seton Hall University would do well to cancel this course and replace it with one that teaches students how to appreciate the beauty of abstinence, modesty and heroic purity.